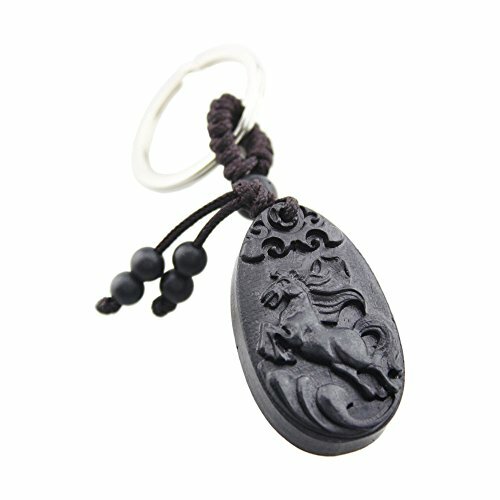 FOY-MALL Chinese Zodiac Horse Ebony Wood Keychain for Men/Women Gift M1105 | What Should I Say? The keyring is carved from ebony wood. The wood product has always been very good talisman. It is said that wearing ebony product can bring in good luck. Horse is one of the twelve Chinese zodiac animals. In China, the horse symbolizes success. There is a Chinese adage: win success immediately upon arrival. The animal keychain can be used as keychain pendant, bag decoration, ornaments or gift. Important Shipping Information: Please kindly be aware that item is from China and it may take 7-15 days to arrive. If any questions, please feel free to contact us. Due to manual measurement, it maybe cause the deviation. The pendant is the horse. The back of the keychain reads: 'amulet'. The keychain is to give both are fine for personal use or to share. If you have any questions about this product by FOY-MALL, contact us by completing and submitting the form below. If you are looking for a specif part number, please include it with your message.